Photos of the day Chinese (PLAAF) and Pakistani air forces is joint exercise. Images shows the J-10 fighter of the Air Force Chinese People’s Liberation Army (PLAAF) and Mirage-III fighter of the Pakistani Air Force. The air forces of China and Pakistan successfully joint exercise codenamed “Shaheen-II” within the territory of China. The “Shaheen-II” aims at promoting friendly cooperation between the two air forces. FBC-1 fighter-bomber nicknamed “Flying Leopard” of the PLAAF and a J-7G fighter of the Pakistani Air Force are seen parking in the apron. 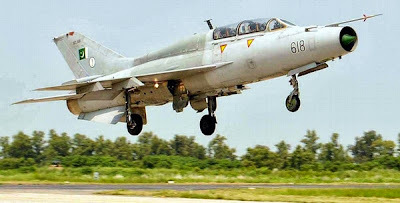 Images shows the Mirage-III fighter of the Pakistani Air Force takes off from a military airport in Pakistan to take part in the “Shaheen-II” joint exercise. J-7 fighter of the Pakistani Air Force takes off from a military airport in Pakistan to take part in the “Shaheen-II” joint exercise to be held in China.